During the week I really don't feel like cooking dishes that take a lot of time. On the weekends, however, I enjoy trying out new recipes and spending more time in the kitchen preparing for the week ahead. Last weekend I found a recipe for vegetarian meatballs that I just had to try. Since I had plenty of time on Sunday, I decided to make spaghetti with these "not-meatballs." I made my own marinara sauce using this recipe, but of course jarred marinara would be fine as well. 1) Preheat oven to 375 degrees. Prepare a parchment-lined cookie sheet. 2) Heat oil in a large frying pan over medium heat. Add onion and garlic and sauté until onions are golden, about 10 minutes. In a food processor, combine remaining ingredients and process until almost smooth. Add onion-garlic mixture and process until combined. 3) Using a small ice cream scoop or tablespoon, scoop out mounds of mixture, roll into balls, and place on cookie sheet. Bake for 30 to 35 minutes until tops are browned. Serve immediately or store in refrigerator for up to 4 days. I love how the "meatballs" turned out. They were very crispy on the outside, but soft and fluffy on the inside. I have plenty marinara sauce and meatballs left so I'm thinking of making meatball subs later in the week. Even if you think you'd still prefer traditional meatballs, I encourage you to give these a try. I think you'll be pleasantly surprised! They look lovely, I'm not keen on the meat kind so may give these a go. I should not have read this post while hungry. Those non-meatballs look delicious, and perfect for the cooler weather we've been having! Ooh - these sound good - I was just saying that I was feeling stuck with our dinners. Will try this one! Haha, I've been eating candy corn like it's going out of style so I am bad too. Although we certainly are not vegetarians, the ingredients sound great and I bet these taste delicious -- thanks for sharing this recipe. I just made spaghetti and meatless (store bought) balls in home-made marinara for my gang Monday night. Everyone ate them, but it was the sauce that saved them- pretty flavorless without it. I can't wait to give this recipe a try! I really liked these because of the texture. They were wonderful with the marinara, but I don't think I'd eat them just on their own. Hi, I’m Anne from Life on the Funny Farm (http://annesfunnyfarm.blogspot.com), and I’m visiting from Tilly’s Nest. I've been trying to feed my family more meatless dishes, but we've all been missing the meatballs in the spaghetti, so I'll definitely have to try this one. Thanks! Hope your family enjoys the not-meatballs :) And you can check out my "food" tab under my banner for more meatless recipes! Thank you so much for coming by! I hope you get some chickens - they are the best! And you can't beat freshly laid eggs :) Have a great day! These look delicious, will have to give them a try! I made a raw vegan taco using chopped walnuts, nama shoyu and cumin as the "meat" substitute and it surprisingly tasted just like taco meat! Being a vegetarian you get to discover all sorts of new flavors that you normally wouldn't try! Wow, your tacos sound great! I recently made tacos with Lightlife brand veggie protein crumbles and it was pretty close to ground beef. I used the same homemade taco seasoning on the crumbles and they were really good! I have discovered so many new foods over the past few years! I love your blog - so glad I discovered it! These meatballs look amazing and like you, I'm into "non meat" dishes these day. Love veggies and everything that I can grow here in NH (which is slim now). Come visit me! I'm following you now too! Thank you for this recipe. As a vegan, I'm always looking for No Meat recipes that aren't always soy based! Sounds tasty! I bet they would freeze well. Another way to make vegetarian "meat" sauce is with garbanzo beans--it's easy! That "meat" sauce sounds interesting! Never would have thought of adding chickpeas but it sounds really good. This is such an excellent recipe to forward to my daughter. Thank you! These look delicious! If I tweak a bit, they will be gluten-free too for my lil' guy! Thanks for sharing! Great! I hope you guys enjoy! Thanks for linking in to Food on Friday: Pasta and Noodles. If you pop back in a day or so there should be a fantastic collection of all things pasta and noodles. Wow, what an interesting way to make meat-free meatballs. Using the walnuts is especially intriguing to me, I will have to bookmark this. Thanks for sharing at Meatless Monday last week :) I hope you had a nice holiday :) Check your email! Hi Tammy, I made these again tonight for dinner but this time added some sliced baby bella mushrooms to the onions and garlic. 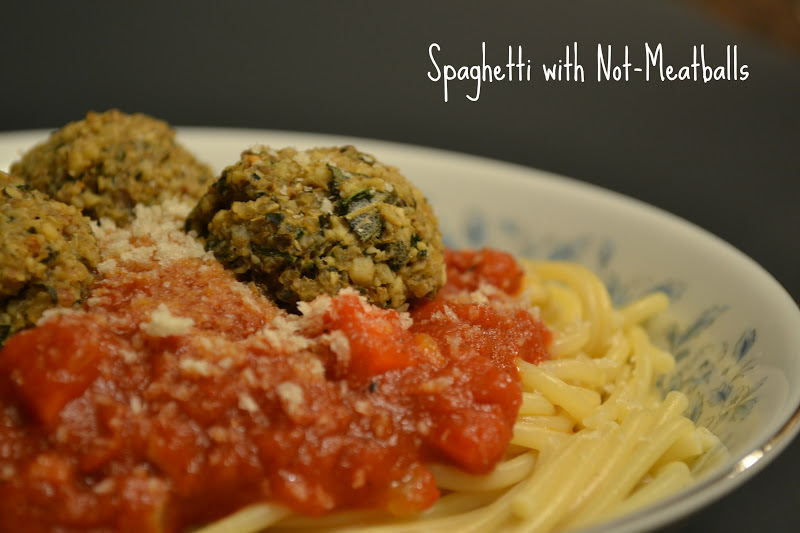 They taste even better and when the sauce is added they taste just like meatballs! We used to buy eggplant meatballs, but will be making these from now on! Thanks for the recipe! Awesome! I'll try the mushrooms next time I make these. Thanks for letting us know!